Firstly, the name: Red Psycho Llama. Memorable, sure, but… why? Well, there is a reason. It’s a play on the old going-green mantra: reduce, reuse, recycle. Recycle = redpyscho. Say it all together and it all makes sense. The Red Psycho Llama Eco Hostel is, as the name suggests, focused on protecting the environment while playing host to travelers staying in Miraflores, Lima. Eco hostels are popping up in Peru and everywhere else these days and -- let’s be honest -- sometimes the eco-friendly stuff is much more of a gimmick than anything substantial. At Red Psycho, however, there’s no denying a genuine push for sustainability and an authentic desire to promote recycling. From the names of the rooms (Glass, Paper, Plastic etc.) and their corresponding recycled decorations, to the free trade products on sale and the energy saving installations, it’s clear that this hostel does more than enough to warrant its “Eco” tag. You can’t even get a business card at reception because of the hostel’s “think before printing” philosophy. Fair enough. With a bed in a five-person mixed dorm costing a hefty S/.56, most shoestring backpackers will shy away from a night at Red Psycho. After all, it’s not hard to find a dorm in Lima, even in central Miraflores, for half that price (Friend's House, for example). Prices jump even higher for a four-bed dorm (S/.80) and quickly reach hotel prices for a private room (S/.180). The rooms at the Red Psycho Llama Eco Hostel are bright, quirky and colorful. Most of the decorations and some of the fixtures are made from recycled materials; the bunk beds are sturdy and comfortable; the bathrooms (some shared, some ensuite) are modern and clean; and the showers are hot and strong. Each room has its own character, determined in part by the recyclable material after which it has been named. The matrimonial room, known as Vidrio, is decorated with recycled glass elements, including a glass bottle chandelier; Lata, meanwhile, is a five-bed dorm with a tree mural made from tin cans. 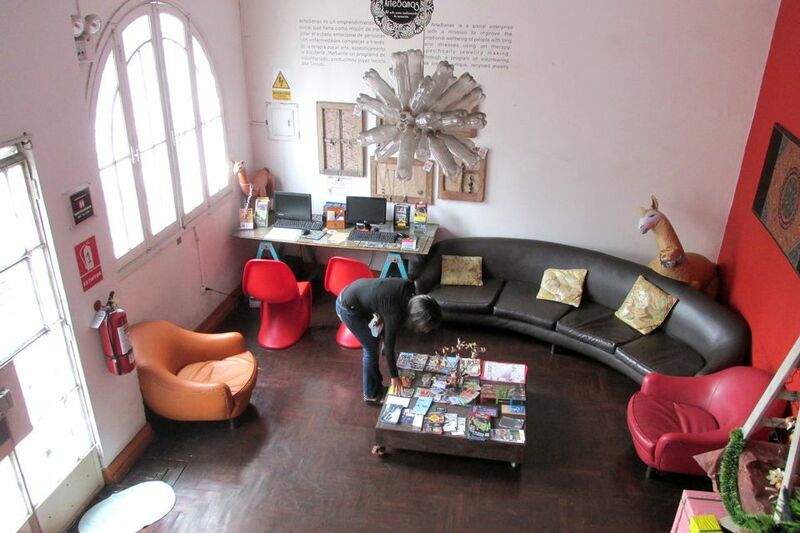 The communal areas at Red Psycho Hostel are some of the most inviting that I’ve seen in Miraflores. The reception area lounge is fun and funky, with leather couches, a plastic bottle chandelier, and a few llamas dotted around the room. Then there’s the breakfast area, with a few tables and chairs and a large cushion-covered seating platform where guests can lounge around and play guitar. The colorful communal kitchen area is another cool little nook to hang out in, cook and make new friends. Even better is the rooftop terrace. This is the kind of space that no backpacker in Lima can resist: an elevated oasis amidst Lima’s nonstop throng, a place of potted plants and colorful murals, with views across the buildings below and up to the shiny glass-fronted towers of Miraflores’ moneyed corporations. This is the place to sit and get philosophical, or sit and make friends over a few beers or a bottle of pisco (and then put your bottles in the recycling bin). In terms of location, Red Psycho Llama is particularly well situated if you want to be near the action in central Miraflores. It’s just two blocks north of Parque Kennedy and in easy walking distance of bars, clubs, restaurants, cafes and a cinema. You’ll be the wrong side of the park if you want to be near the coastal cliffs and the sea, but it’s still only a 10-minute walk to get down to Larcomar, the Parque del Amor, paragliding and other coastal attractions. Despite being close to the heavily trafficked Óvalo de Miraflores and Av. Arequipa, Red Psycho is fairly free from traffic noise, being tucked away down a quieter street, Narciso de la Colina. This area is safe, so you should feel fairly secure even at night. If you do ever have problems, you can rely on the hostel staff to give you all the advice and assistance you need. The bilingual staff members are professional and caring – their concern for the environment is matched by their concern for their guests. They’ll happily arrange a taxi for you, or give you advice about nearby attractions and transportation options for getting around the city. The breakfast at Red Psycho is good but not outstanding – a little more interesting than the typical bread and jam at most hostels. You can refill your water bottle for S/.1 using the hostel’s filtered water, which is a nice touch. Wi-Fi connections seemed good throughout the hostel, even on the rooftop. The attentive staff and the range of excellent communal areas really help Red Psycho Llama Eco Hostel stand out in the crowded Miraflores hostel market, and the green side of things is an added draw for people who want to travel with as little environmental impact as possible. Red Psycho won’t be an option for some shoestring backpackers simply because of the comparatively high rates, and you can certainly find cheaper options in Miraflores. But if you’re happy to spend more money for a hostel that is environmentally conscious, friendly and fun, you won’t regret the investment.